Papua Diving Resorts include the upmarket Sorido Bay Resort and the budget Kri Eco Resort both on the eastern tip of Kri Island in the Dampier Strait, fantastic diving on their amazing rich house reef and 30 of Raja Ampat top dive sites, all within a 10km radius of the resort. 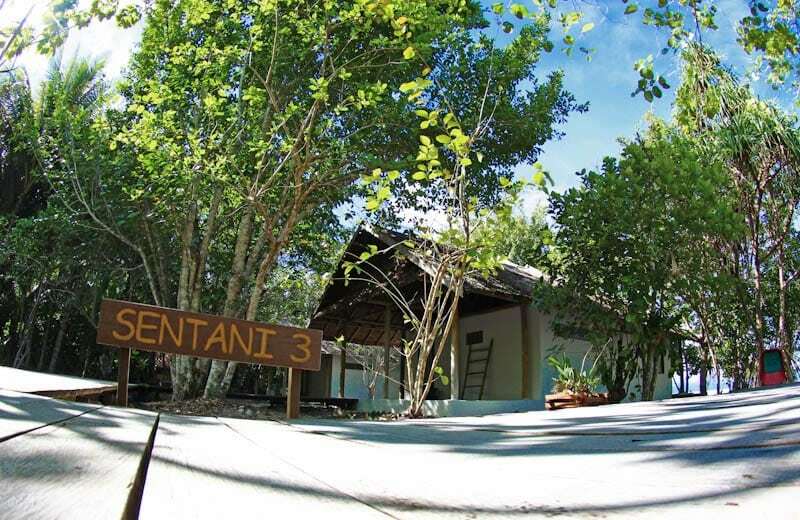 Kri Eco Resort has a total of 13 guest cottages for up to 26 guests: Four Standard Papuan Water Cottages with shared ‘mandi’ type bathrooms (traditional Indonesian bathroom with cold water and no shower but western toilet). Seven Superior Water Cottages with shared ‘mandi’ type bathrooms (but with hot water shower and western toilet). 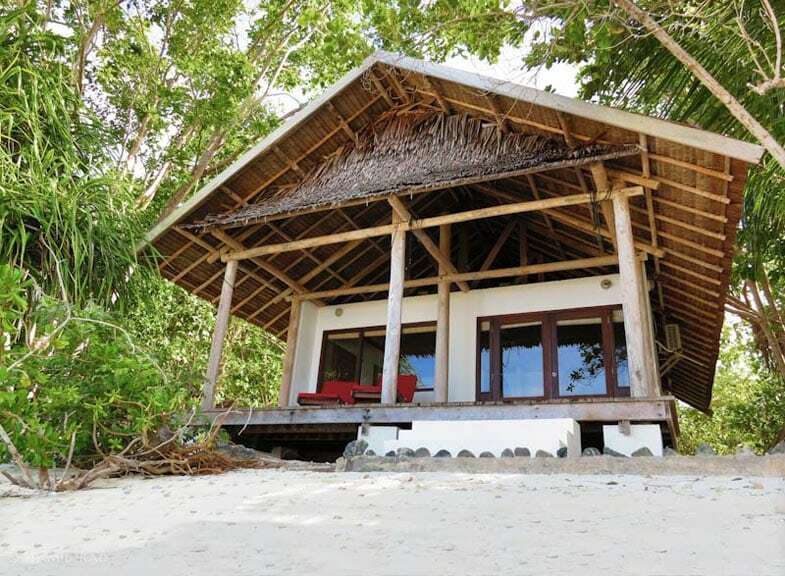 Two Deluxe Water Cottages, located on the beachfront, with a spacious private sundeck and a private western style en suite bathroom including hot shower. All guest cottages feature a western style bed and mattress, mosquito nets and camera table with several sockets. They all have 24hour electricity and fans (no aircon), and all furnishings are hand-made. 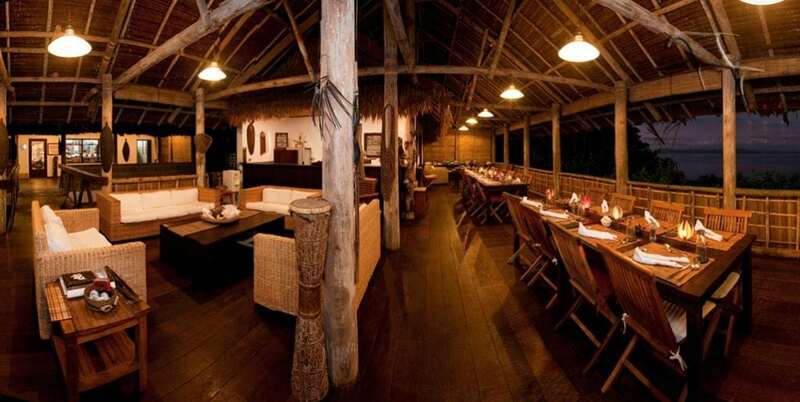 Meals are served in the restaurant, a large over-water dining area – open to the ocean breeze, with long tables sheltered by a traditional palm thatched roof. The kitchen is always busy with staff cooking over the gas burners in large woks or stew pots. Bread is freshly baked and pizza is a frequent treat. In the back, there are more staff slicing fresh vegetables and fruits in the open air under the shade of the trees. Each meal is freshly prepared, and ice boxes, supplied weekly from Sorong, contain fresh meat (but can chill a beer if required). Coffee, tea and flavoured drinks are available all day. The resort is located on a spectacular lagoon, where clear blue waters meet a brilliant white beach. The traditionally built water bungalows create a beautiful South Seas ambiance. 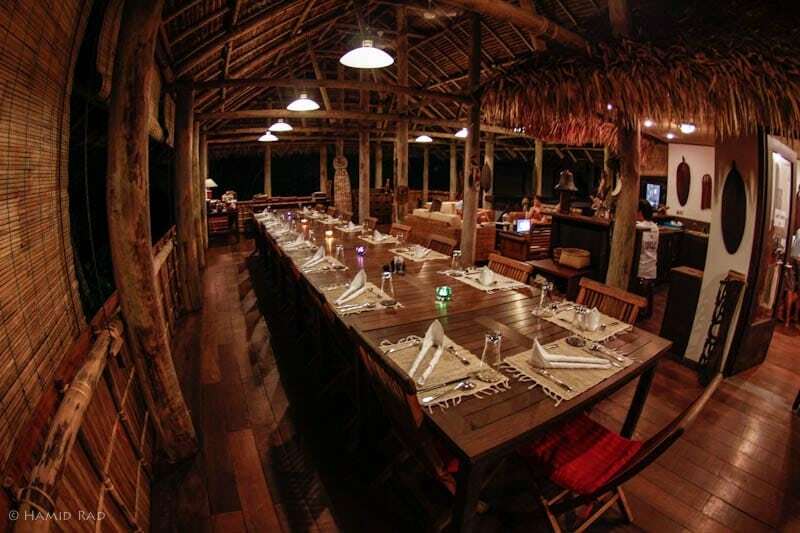 Although the accommodation at Kri Eco Resort is very basic, it is functional with a lot of atmosphere. Free Wi-Fi internet access is only available at the Sorido Bay Resort. Although it can be intermittent, the resort has a mobile signal. Kri Eco Resort is ideal for divers traveling on a budget who choose the proximity of pristine nature over a long list of resort amenities. The per person pricing above is indicative only: we show 7 night with unlimited dive packages at high-end and lower-end rooms (singles & doubles) for the purposes of comparison. We can give you a price (and availability) for any combination of nights/dives you wish to undertake, which will include any discounts due to you as part of that package, and any exclusions, or items payable at the resort. Use the [Enquiry & Booking] button to give us your exact requirements and we'll give you the best deal we can. Sorido Bay Resort is operated by one of the pioneers of Raja Ampat diving, Max Ammer and his team, and its picture-perfect setting on a deep water lagoon combines luxury Western amenities with relaxed Papuan lifestyle. 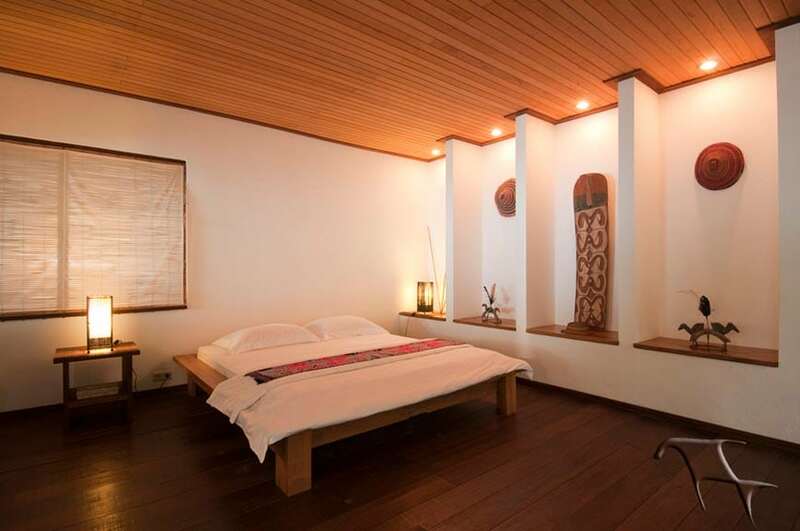 Sorido Bay Resort has been built with the needs of dive photographers in mind. There are seven beachfront bungalows each with en suite facilities and a private courtyard, and a fantastic view over the lagoon. 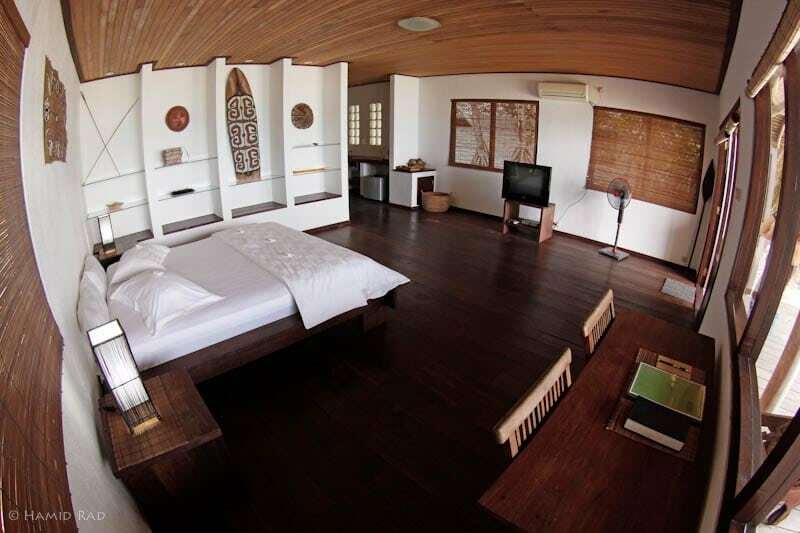 All interiors are decorated in Papuan style using museum quality artifacts and offer the following luxurious amenities: Air-conditioning, hot showers, television, fridge and a special area for photographers – a spacious table especially set up for camera work with good lighting and 110V & 220V build-in electricity outlets. These camera tables also have built-in sinks and running water. There are two main buildings completing the resort set up. There is a spacious dining area with splendid views over the bay. The other building houses the lobby, office, kitchen, library, internet lounge, and souvenir shop. A sundeck and wet lounge is to be found on the jetty for those who just can’t get enough of the views. 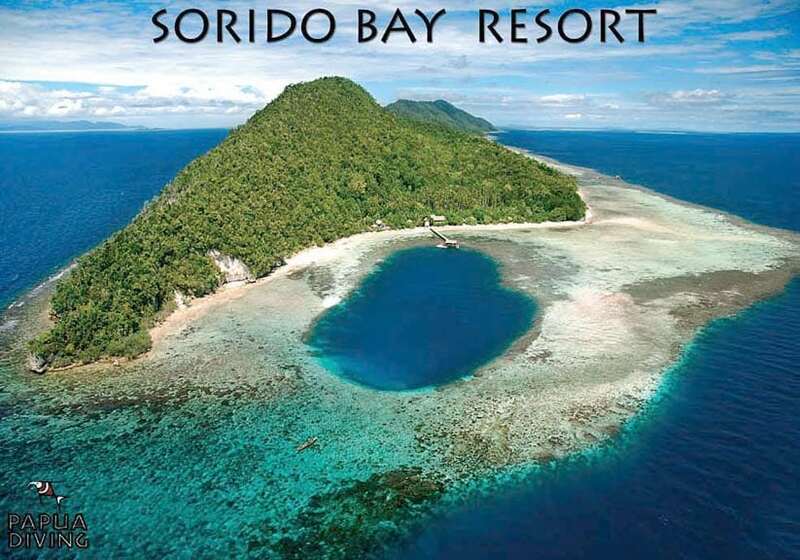 Sorido Bay Resort is the ideal destination for divers who enjoy peace and solitude on a deserted island surrounded by luxurious amenities and friendly attentive service. The diving facilities are top of the line, and Kri Island is the best place in Raja Ampat to encounter mantas, sharks and pelagics. Kri Island is located in the Dampier Strait, between Waigeo and Batanta, about 2 hours by boat from Sorong. Guests who arrive on Sunday morning in Sorong must ensure they arrive before 8am for a same day transfer to the resort. 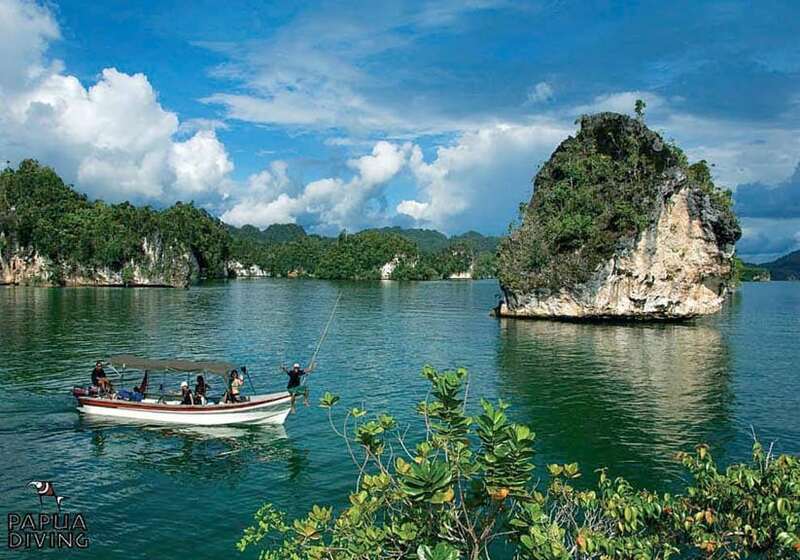 There is only one free boat departure to Kri Eco Resort on Sunday which departs latest at 9am. Guests who depart from Sorong on Sundays or Wednesdays must book a departure flight after 10am. For a 10 night stay, the best option is from Sunday to Wednesday as no extra nights in Sorong are required and only 1 Saturday is spent without boat diving; though 10 night packages can also be arranged from Thursday to Sunday; (however, a night must then be spent in Sorong because the boat departure to Kri Island on Thursdays is very early in the morning). With over 20 years of experience, Papua Diving are one of the pioneers in Raja Ampat diving. Papua Diving is the dive operation for Kri Eco Resort and Sorido Bay Resort, both located on Kri Island, in the famous Dampier Strait, about a 2 hour boat ride northwest of Sorong. Each resort operates its own Papua Diving Dive Centre. Papua Diving has seven custom built fibreglass dive boats that head off for a fresh diving adventure each day. All boats are equipped with Emergency Oxygen, First Aid kit, radio, GPS and flares. Towels, drinking water, fruit, snacks and juice are provided on all dive trips. The dive centre provides 12L aluminium tanks with Yoke valves (own adaptor required for DIN regs), 10 full sets of Aqualung rental gear and free Nitrox. There is a no gloves policy. PADI Advanced and Nitrox courses can also be arranged. It is important to note that the resorts have a no boat diving policy on Saturdays as this is the day of rest for all staff at both resorts. Boat diving is not offered between 6pm Friday and 6pm Saturday but boat night diving is possible again at 7pm on Saturday. Tanks are provided to dive from the resorts’ jetties during Saturday. Kri Island is one dive destination which has it all: shore and boat diving, house reef, coral gardens, swim-throughs and reef walls, with sharks, manta rays, whales, dolphins, and plenty of other critters. There are more than 30 dive sites surrounding the resorts. Most dive sites are between 5 to 15 minutes away and offer world class pristine reef diving. Three guided boat dives are offered per day plus an additional night/dusk dive (max. 4 dives per day). Max. 6 divers and 2 dive guides per boat. The dives included in the unlimited dive packages are within a 10km radius of the resorts. Due to the close proximity between resorts and dive hot spots, it is Papua Diving’s custom to return to the resorts for the surface intervals. Excursions to more distant dive sites are can be arranged, though a fuel surcharge will apply). These half/full day dive trips include picnic lunch on remote and pristine beaches. Sorido Bay Resort is surrounded by the most spectacular house reef. More than 283 different species of fish have been recorded during a single dive on their house reef, Cape Kri. This is a world record and makes it the richest house reef anywhere in the world! 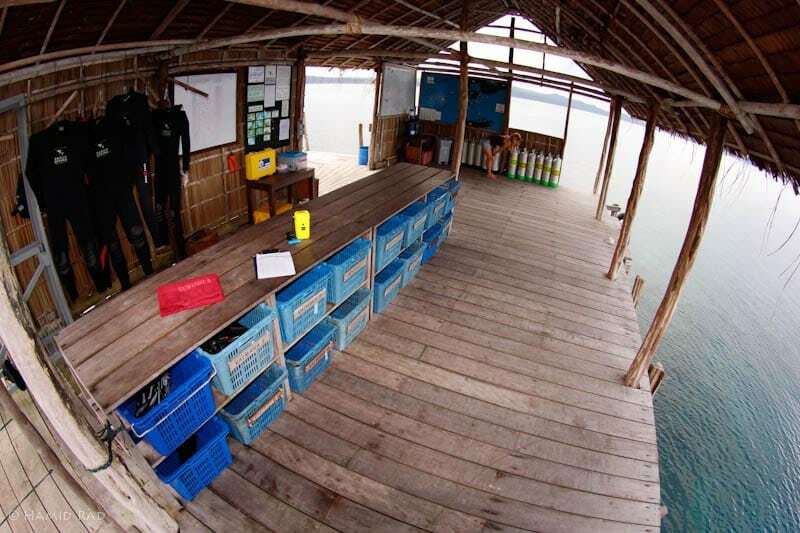 Cape Kri is Sorido Bay’s house reef but is less than 3 minutes by boat from Kri Eco Resort. ‘Sardines’, ‘Manta Sandy’ (famous manta cleaning station) and ‘Blue Magic’ are just a few of the most popular dive sites within minutes of both resorts. The water temperature is 27-30°C (80-86°F) all year round, air temperature 24-34°C (75-93°F) and visibility 10-30m (32-100ft) in general.